Complex technology brings complete compatibility. The diameter of the particle is within 20 nanometers, which makes a clear printing, great liquidity and prevents any printing head clogged. The ink are stored in a constant pressure structure, making stable outflow of the ink, which means smooth and consistent printing. 100% post printing test for each cartridge. 100% Compatible With Original printer,this is NON-OEM,. When install the new cartridges into printer,the computer would promote "Non-Original", please click "Yes" ,then the printer can go on to print. Please make cartridges upside down and remove the protective clip before you install the ink cartridges. Any questions, just feel free to contact us. 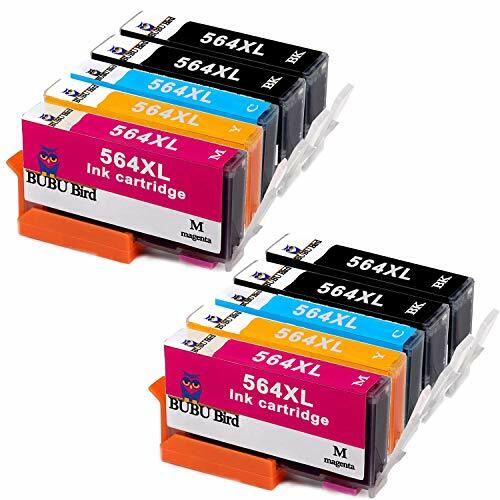 Content: 564XL non-original ink cartridges (4 black, 2 cyan, 2 magenta, 2 yellow) 10-piece. BUBU Bird Manufactured with highest quality and standards for best printing performance matching the standards of OEM. Excellent colour prints matching for true-to-life photos and crisp text. Support: BUBU Bird compatible cartridge HP564 has obtained ISO9001 and ISO14001 certification, 12 months 100% money back guarantee and friendly customer service; If you have any questions, please log in to your Amazon account > click on your account > your Order > Contact Us > Find your order and click Contact Seller, our customer service team will give you a 100% satisfactory response within 24 hours. If you have any questions about this product by BUBU Bird, contact us by completing and submitting the form below. If you are looking for a specif part number, please include it with your message.